This is a wrap up of the players taken from rounds three to seven in last Friday’s national draft. 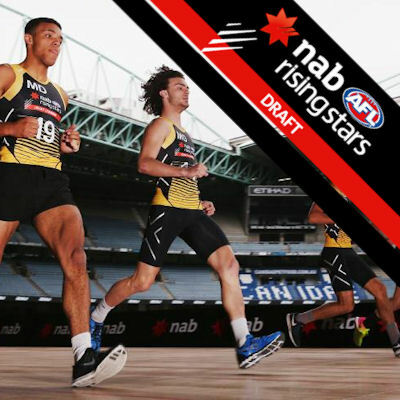 Whilst the draftees taken in the first two rounds will get more of the attention, often the guys selected later still make a splash in their first season. Fantasy Perspective: Probably the steal of the draft in my eyes, considering he was touted as a likely first rounder. Two key aspects for draftees in their first seasons are size and endurance. Murphy has both covered. Since fixing his attention to football, Murphy rose up rankings and mock drafts, emerging as a probable first-rounder. Season average of 77 fantasy points stemmed from 19.7 touches, 5.3 marks, 2 tackles and 0.5 goals a game. Can play straight away if needed. Fantasy Perspective: McPherson could’ve gone much higher if it wasn’t for persistant injury issues. Because of these complaints, he wasn’t able to find his groove for Woodville West-Torrens. An outside player, Andrew provides plenty of run and carry from the wing or half-back and has a terrific attitude. Could manage only and average of 51 in his 4 games this year. Could potentially debut next year but the Crows traditionally ease their draftees in. Fantasy Perspective: Wooller is more of your developed key forward. He isn’t quick or agile and his field kicking could be improved upon, but when the goals are in sight he rarely misses. I can see him succeeding at AFL level as his work rate is excellent and expect to see him feature at times next year, probably as a third-tall forward. Also showed he could play as a big-bodied midfielder with Oakleigh. Averaged 76 fantasy points from 13.8 disposals, 4.6 marks, 3.6 tackles and 1.6 goals per game. Will play games for Brisbane. Fantasy Perspective: Having seen Charlie Ballard play often throughout the season, for Sturt (under-18 and reserves), SA and in-particular Sacred Heart College, I rate him extremely highly. He is 196cm but has the cleanness of a small forward and the foot skills of an outside midfielder. Played at both ends at school level but seems best suited to a wing where his height gives him genuine x-factor. Needs some time to add some size, but could manage a couple of games in 2018. Averaged 18 disposals and 68 points. Fantasy Perspective: I expect to see Ballenden play AFL football next year. The Lions are sure to hand him opportunity in what will be another development year. There’s a lot of subjection around where he plays his best football. I think he’ll be trialled up forward first, pairing up with Eric Hipwood in what will be a very dangerous duo soon enough. Ballenden’s potential game time makes him watchlist-worthy, however don’t be expecting big scores, after he averaged 49 points in 2017. Has already had exposure with the Lions at NEAFL level. Fantasy Perspective: Dixon isn’t your super athletic key forward which seems to be more of the rage lately. Instead he is a true, honest footballer who presents all day long. He averaged 11 disposals, 3.5 marks and 2.3 goals a game for Tassie and the Allies throughout the year, resulting in a fantasy average of 69 points. His average of 3.8 tackles is a sign that the big man isn’t afraid to do the hard stuff. Fantasy Perspective: Worpel should be on your rookie watchlist next year. He is a inside bull that can play round one next year. His leadership, stoppage nous and on-field ferocity will be well valued at the Hawks. Averaged 20 disposals, 3.1 marks, 7.5 tackles, 0.6 goals and 96 fantasy points. Foot skills and speed are his weaknesses, but Worpel’s size will allow for a Powell-Pepper-like first season. Hawthorn will find him a spot in the midfield. Fantasy Perspective: Paton has really benefited from spending another year in the TAC Cup after being overlooked last year. He managed to play a VFL game for Collingwood later in the year. From 16 2017 games, Paton averaged 21 disposals, 4.5 marks, 2.7 tackles and 79 Fantasy points. Paton is one of the best pure defenders taken and I could see him becoming a regular for the Saints soon enough. Can intercept well and also play lock-down roles. Fantasy Perspective: Hayes is quite clearly the best ruck in the pool. But like Tim English last year, he will need a few years to develop in the reserves before making an impact at AFL level. Found enough of the ball for a big man this year, averaging 15.2 disposals to go with 4 marks, 1.1 goals and 81 fantasy points. Won’t do much this year and if he does, it’ll be as a tall forward. But when he develops, Hayes has all the tools to become a premier ruckman. Fantasy Perspective: Baker clearly has a bit of hunger in him to be drafted after the Lions Academy effectively delisted him. Whilst I don’t have any game statistics on him, Baker recorded a time of 2.98 seconds in the state combines 20m sprint as well as a standing vertical jump of 74cm. Having already played senior football, the 19-year-old joins the Demons at pick 48 and immediately provides them with outside mid/general defence depth. Fantasy Perspective: Only saw him once live (against the Allies at Adelaide Oval) but was very impressed. Houlahan reminds me of fellow South Australian Will Hayward who had plenty of success in his first year in Sydney. I think Jordan could do similarly next year. Averaged 69 for Sturt and SA. Could transition into a dynamic midfielder within a couple of years. Fantasy Perspective: Tyler Brown is a very different player to Callum who went to the ‘Pies last year. Unlike Callum, who managed five games for the club last year, Tyler will likely need at-least a year to develop his frame, consistency and midfield craft. If this can be done, I reckon he can become an even better player than his brother. Averaged 12.3 disposals, 1.9 marks, 1.4 tackles, 0.4 goals and 42 fantasy points in 2017, so production will need to improve if he is to become fantasy relevant. Still a 17-year-old so potential is high. Fantasy Perspective: This draft has quite a few defenders/wingers with speed and foot skills. Kane Farrell is another one of these types. Endurance may prevent him from playing much for the Power next year. Averaged 15 disposals, 4.5 marks, 2.7 tackles and 66 fantasy points for Bendigo and Victoria Country throughout the year. Appears to be behind a few at Alberton. Fantasy Perspective: Crossley is a massive unit. And he uses his physicality to good effect in the ruck. With Jarrod Witts and Tom Nicholls ahead of him in the ruck department, Crossley will likely have to bide his time in the NEAFL next year as he builds on his endurance. Produced some solid numbers in the U18 Champs and for the Suns NEAFL side, averaging 13.6 disposals, 2.9 marks, 3.4 tackles, 24 hit-outs, 1.1 goals and 88 points. Worth a spot on the bench if he gets a game. Fantasy Perspective: For a rebounding defender, Stoddart’s number weren’t ground-breaking, averaging 14.2 disposals, 2.6 marks, 1.2 tackles and 50 points. Similar to Kade Simpson in the way he sets up the play. May break through for a couple of games but don’t think he’ll be a prolific scorer. The Swans aren’t general afraid of getting games into youth early on. Fantasy Perspective: Payne is one of the better key defenders in the draft pool. He is a big, strong unit, making him difficult to beat in one-on-one situations. However he is able to match this strength with neat foot skills in the back half (scored 29/30 at combine kicking test). Will be behind Harris Andrews and Daniel McStay in the key defensive pecking order, however he could be exposed to AFL level at some point next year. Not a fantasy relevant player for next year though, averaging just 37 fantasy points. Fantasy Perspective: Nutting will add some versatility to the Suns young list. Will likely start as a defender where his shutdown ability will be well valued. Endurance and consistency will require some work. Averaged 46 fantasy points at the Under-18 Championships. A ready-made small forward who gets his chance on a senior list at the age of 22. Langdon has earned his spot after spending the past two years in the WAFL for Claremont. He won the Yo-Yo test at the WA State Combine, highlighting his enormous endurance. Possesses elite running and foot skills, and pushes hard to impact up the ground as well as in the forward 50. Fantasy Perspective: The Giants are building a bit of a reputation for drafting mature-age or recycled players. Zac Langdon, a 22 year-old for Western Australia, joins that growing list. Langdon is skillful player who averaged 17.7 disposals, 3.8 marks, 4.2 tackles, 1.7 goals and 85 Fantasy points at league level for Claremont. Could be a good option if the Giants injury woes continue into next year. Fantasy Perspective: As stated above, Miers was brilliant on the TAC Cup’s biggest stage. Unlike many other small forwards, his speed isn’t all that good. Instead, he uses his smarts to damaging effect inside 50. Posted strong numbers throughout the year, averaging 17.5 disposals, 4.4 marks, 3.8 tackles, 1.6 goals and 84 points per game. Capable of playing senior football next year, Miers is another small to watch out for. Fantasy Perspective: Jared Polec is probably the best comparison to be made with Jake Patmore. The Western Australian is speedy, good by foot and productive but his inside game is a weakness. Averaged 23 touches, 4.1 marks, 3.6 tackles and 82 fantasy points for Claremont and WA. Patmore is one I would put on the watchlist as he can certainly find the ball. Fantasy Perspective: Although small in stature, Mitch Crowden is a really powerful unit. He is strong in the hips, very athletic and I think he represents good value at pick 59, despite not being rated highly by many draft watchers. Was prolific for SA, averaging 22 disposals, 3.3 marks, 5 tackles, 0.5 goals and 81 points. He is ready made and can play next year. Another smaller-type player to jot down. Fantasy Perspective: I wouldn’t at all be surprised if Joel Garner featured heavily next year. Not only is his frame ready, his attitude is impeccable. Not a big-time ball winner throughout the year, resulting in an average of 67 points from 15.9 disposals, 3.2 marks and 3.7 tackles. His speed, foot skills and football smarts could see him used as a ‘kicker’ off half-back for the Power. Fantasy Perspective: Of the Power’s five national draftees, Dom Barry looks the best fantasy option. Having already been exposed to AFL action, his endurance and frame are well developed, allowing him to potentially slot straight into the Power lineup and score relatively well. I think he’ll get games, but it’ll be interesting to where Barry fits in. Fantasy Perspective: Hayden is a big unit which would have appealed to numerous clubs. His endurance needs to be worked on during the pre-season and could limit Hayden’s AFL exposure next year. Averaged 16.8 disposals, 2.7 marks, 4 tackles and 65 points for WA and Subiaco last year. With North in rebuild mode, Kyron Hayden looks likely to debut next year. Fantasy Perspective: The Tigers needed some key position talent, despite winning the premiership with just one tall up forward. After already securing Coleman-Jones and Balta, Richmond went with another ultra-athletic type in Ben Miller. Miller is super fast and can play either end. The Western Australian will take a few years to develop his craft but I rate him as a prospect. Fantasy Perspective: Shipley joins the Giants via their academy. It won’t be easy for him to break into the side, especially given their midfield depth. His kick:handball ratio isn’t ideal (average of 4.8 kicks and 11.5 handballs), however he does play that in-and-under contested role. Speed and defensive pressure is excellent. Averaged 61 points for the Allies. Fantasy Perspective: Thomas North is one of the better stoppage players in the pool. He finds plenty of the ball, is strongly built and definitely capable of fronting for the Dockers next season. He averaged 20 disposals, 3.2 marks, 4.4 tackles and 78 fantasy points for Eastern and Metro. North is a solid, well-rounded midfielder worth keeping an eye on ahead of 2018. Fantasy Perspective: Zerk-Thatcher was a speculative pick by the Bombers but he has some traits which could hold him in good stead. He is one who will take time to develop in the VFL. Only averaged 37 fantasy points for SA – not fantasy relevant. Prolific ball-winning small forward or midfielder with football smarts in reading the play. Positions himself well as a crumbing forward and uses the ball well. Had a great NAB AFL U18 Championships for Vic Metro winning U18 All Australian honours. Top performer in the 2km test at Draft Combine with his time of 6:09 the best recorded. Fantasy Perspective: Yet another small who had the ball on a string in 2017. Moore averaged 24.3 touches, 3 marks, 4.5 tackles, 0.9 goals and 92 fantasy points per season. He’s obviously small in stature and needs to bulk up before making the jump. If he gets games, he’ll play as a small forward where he has still managed to be productive. A steal at pick 67, Moore is very fantasy relevant. Fantasy Perspective: Hamish Brayshaw was a needs-based selection for the Eagles. He is ready to go in terms of physical development and averaged 114 fantasy points throughout the TAC Cup season. His averages of 24 disposals, 5.5 marks, 6.5 tackles and 1.5 goals suggests he is a very well-rounded player. Hamish is high on my players to watch next year, given the Eagles lack of inside midfielders with the departures of Priddis and Mitchell. Fantasy Perspective: Meek joins the Dockers who are assembling a nice ruck unit. Meek and fellow draftee Scott Jones join Sean Darcy in learning under the guidance of the ageing Aaron Sandilands. All four stand over 200cm and weigh in excess of 100kg’s. Lloyd will be behind Darcy and Sandilands but is physically mature and could play a role up forward. Averaged 58 points for Greater Western Victoria. Fantasy Perspective: Schumacher is another athletic midfielder/defender drafted by the Blues. Averaged 13 disposals, 4.5 marks, 1 tackle and 52 fantasy points throughout the year. Doesn’t appear to be a big scorer but the Blues will give him every chance of debuting next year. Fantasy Perspective: Ross is another high-potential outside midfielder or third-tall forward. Still lanky, I suspect 2018 will be a development year for him despite his strong endurance base. Averaged 17 disposals, 3.6 marks, 2.7 tackles and 1.6 goals per game for an overall average of 80 fantasy points. Fantasy Perspective: Xerri is definitely a long-term ruck prospect, but his numbers this year suggest he has some potential. Averaged 9.5 disposals, 13.1 hit-outs and 3.5 marks for Western and Vic Metro. However it’s his average of 4.5 tackles which stands out most for me. Managed to play three VFL games for Werribee where the Kangaroos coaching staff got to work with him. Despite North being in rebuild phase, Goldstein and Preuss are well ahead of Xerri at the moment. Fantasy Perspective: Switkowski has finally got his chance on an AFL list. He is still a skinny type, but his time playing senior football in the VFL will allow him to play AFL in 2018. The Dockers have little choice but to blood youth, so I suggest Switkowski could become a regular. One to keep an eye on. Fantasy Perspective: Callum Porter had an excellent season and put up some great numbers. He averaged 21 disposals, 3.9 marks, 7.7 tackles and 102 fantasy points for Gippsland. Callum Porter feels like a Bulldogs pick and is a good fantasy scorer, but opportunity will likely be the biggest hurdle. Fantasy Perspective: Freo’s second ruck selection of the night was Scott Jones from the WAFL. Whilst Sean Darcy will be the Dockers future number one ruck, Scott Jones will provide decent backup. Doubt Sandilands will play all 22 games and Darcy’s tank still requires work, so Jones may get a look in at some stage. Is ready to go when required. Fantasy Perspective: The Bombers biggest list need was an inside midfielder and in Guelfi, they get just that. He is very versatile but I like him in the middle. Given the departures of Stanton, Watson, Bird, Hocking, Howlett and Kelly, Essendon are very light on in the midfield department. Given his WAFL experience, expect Guelfi to get games. Wasn’t a huge scorer, averaging 69 but was played in a variety of different roles. Fantasy Perspective: This selection makes plenty of sense from the Kangaroos perspective. Hartung can come in and immediately add speed and run to a very slow engine room. Will play every game barring injury, however he has never really been a big scorer. Fantasy Perspective: No one saw this coming. The Blues have got a very talented player on their hands who, by all reports, seems committed to making it in the AFL after his career stalled due to family reasons. Clearly Garlett has potential, given he was a first round draftee back in 2014. Garlett will play games next year for the Blues. Averaged 75 points in the WAFL this season so is one to track in pre-season.